The Pierre Pflimlin bridge is a balanced cantilever made of concrete, shown here under construction. 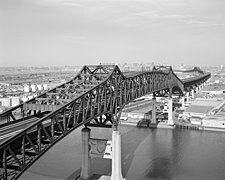 Engineers in the nineteenth century understood that a bridge that was continuous across multiple supports would distribute the loads among them. This would result in lower stresses in the girder or truss and meant that longer spans could be built. :57, 190 Several nineteenth century engineers patented continuous bridges with hinge points mid-span. :75,79 The use of a hinge in the multi-span system presented the advantages of a statically determinate system and of a bridge that could handle differential settlement of the foundations. :190 Engineers could more easily calculate the forces and stresses with a hinge in the girder. A simple cantilever span is formed by two cantilever arms extending from opposite sides of an obstacle to be crossed, meeting at the center. 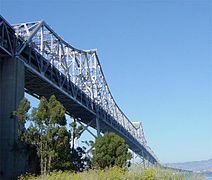 In a common variant, the suspended span, the cantilever arms do not meet in the center; instead, they support a central truss bridge which rests on the ends of the cantilever arms. The suspended span may be built off-site and lifted into place, or constructed in place using special travelling supports. A common way to construct steel truss and prestressed concrete cantilever spans is to counterbalance each cantilever arm with another cantilever arm projecting the opposite direction, forming a balanced cantilever; when they attach to a solid foundation, the counterbalancing arms are called anchor arms. Thus, in a bridge built on two foundation piers, there are four cantilever arms: two which span the obstacle, and two anchor arms which extend away from the obstacle. Because of the need for more strength at the balanced cantilever's supports, the bridge superstructure often takes the form of towers above the foundation piers. 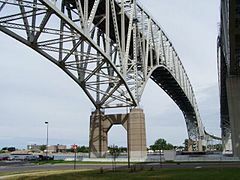 The Commodore Barry Bridge is an example of this type of cantilever bridge. Steel truss cantilevers support loads by tension of the upper members and compression of the lower ones. Commonly, the structure distributes the tension via the anchor arms to the outermost supports, while the compression is carried to the foundations beneath the central towers. Many truss cantilever bridges use pinned joints and are therefore statically determinate with no members carrying mixed loads. Some steel arch bridges (such as the Navajo Bridge) are built using pure cantilever spans from each side, with neither falsework below nor temporary supporting towers and cables above. These are then joined with a pin, usually after forcing the union point apart, and when jacks are removed and the bridge decking is added the bridge becomes a truss arch bridge. Such unsupported construction is only possible where appropriate rock is available to support the tension in the upper chord of the span during construction, usually limiting this method to the spanning of narrow canyons. The old eastern span of the San Francisco-Oakland Bay Bridge, pictured in August 2014, is deconstructed in nearly the reverse order of its construction. Similar temporary supports were used under each anchor arm during the bridge's construction. 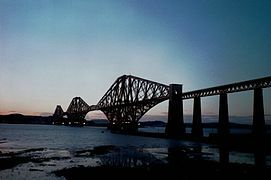 The Forth Bridge with its three double cantilevers. The Vejle Fjord Bridge is a concrete bridge built using the balanced cantilever method. ^ a b DuBois, Augustus Jay (1902). The Mechanics of Engineering. New York: John Wiley & Sons. Retrieved 2008-08-10. ^ a b Bender, C. (1890). "Discussion on Cantilever Bridges by C.F. Findlay". Transactions of the Canadian Society of Civil Engineers. Canadian Society of Civil Engineers. 3. Retrieved 2008-08-10. ^ a b c d e DeLony, Eric (1996). "Context for World Heritage Bridges". World Heritage Sites. International Council on Monuments and Sites. Archived from the original on 2005-02-21. Retrieved 2008-08-10. ^ Waddell, J.A.L. (1916). Bridge Engineering - Volume 2. New York: John Wiley & Sons, Inc. p. 1917. Retrieved 2008-08-19. ^ Durkee, Jackson (1999-05-24). National Steel Bridge Alliance: World's Longest Bridge Spans (PDF). American Institute of Steel Construction, Inc. Archived from the original (PDF) on 2002-06-01. Retrieved 2007-11-03. "Bridge, Cantilever" . The New Student's Reference Work . 1914. This page was last edited on 24 March 2019, at 20:28 (UTC).